After taking his first wife, Adele Lowen, on a magic carpet ride from a middle-class existence on the Upper West Side to a life of opulence, Browning was duly repaid by being cuckolded multiple times by the svelte and gorgeous Adele. The devastated property mogul divorced her, but retained custody of Dorothy “Sunshine” Browning, one of their two adopted daughters. His antics in seeking a young teenage “playmate” for nine-year old Dorothy in 1925 through the classified ad columns of The Herald Tribune attracted the attention of the Queens County D.A. and attracted mobs of reporters and cameramen to his West 72nd Street offices where he personally interviewed many of the 12,000 applicants for the position, finally selecting a Czech girl who lied to him about her age and family circumstances. With the adoption annulled after one week, Browning, who preferred the nickname “Daddy” turned to other pursuits, sponsoring high-school sorority dances in New York with one condition: that he be invited to attend. 15-year old Frances “Peaches” Heenan, a sometime Textile High School student, met Browning at a Phi Lambda Tau social at the McAlpin Hotel. The two began a rapid-fire courtship with Peaches’ parents knowledge and consent, and reporters dogging their every move. Chauffeured to school in Browning’s peacock-blue Rolls Royce and showered with expensive gifts, the zaftig girl soon acquiesced to Browning’s proposal, and the couple was married in Putnam County, NY in April 1926, in part to avoid intense scrutiny from New York City child protection authorities. The marriage lasted only a few months, though, and after Peaches and her mother (who lived with Browning in a series of posh hotels) walked out in October of that year with 20 trunks of finery, Browning sued for an order of separation. Years of litigation followed with Peaches suing unsuccessfully for divorce and alimony, based upon allegations of sexual barbarity. Browning remained one of the premier laughingstocks of New York and across America until his death in 1934. 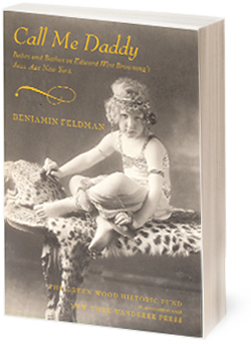 Call Me Daddy is author Benjamin Feldman’s second book. The retelling of this notorious tabloid scandal “captures in delicious fashion the philandering real estate magnate in all his buffoonery” according to Sam Roberts in The New York Times. Call Me Daddy follows the successful publication of Butchery on Bond Street in the summer of 2007, which was brought out by New York Wanderer Press in association with The Green-Wood Historic Fund to a chorus of favorable reviews and extensive coverage in The New York Times, The New Yorker, The Forward, The Brooklyn Daily Eagle, many other newspapers, and on radio in the US and Canada. Click here to listen to David Rothenberg interviewing Ben on the “Any Saturday” program on WBAI, June 13, 2009. Click here to listen to Joe Franklin interviewing Ben on Bloomberg Radio, July 25, 2007.